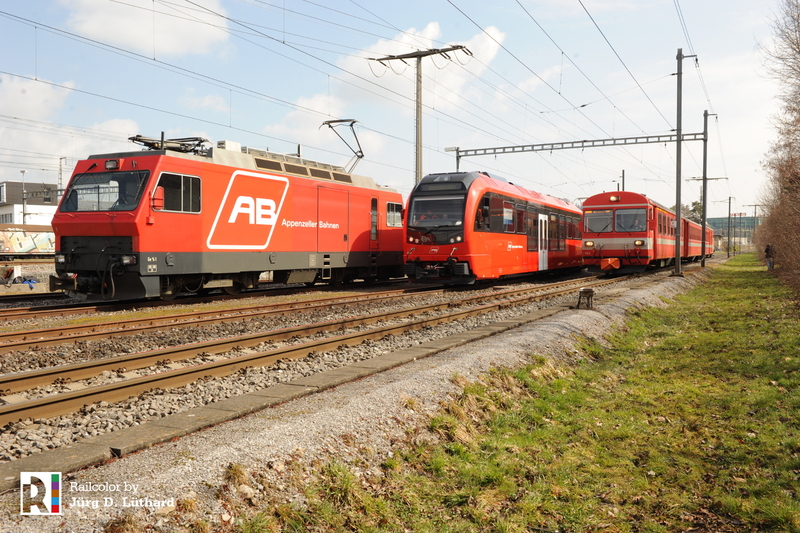 Last weeks Appenzeller Bahnen (AB) received the first units of two new rolling stock series from Stadler Rail. 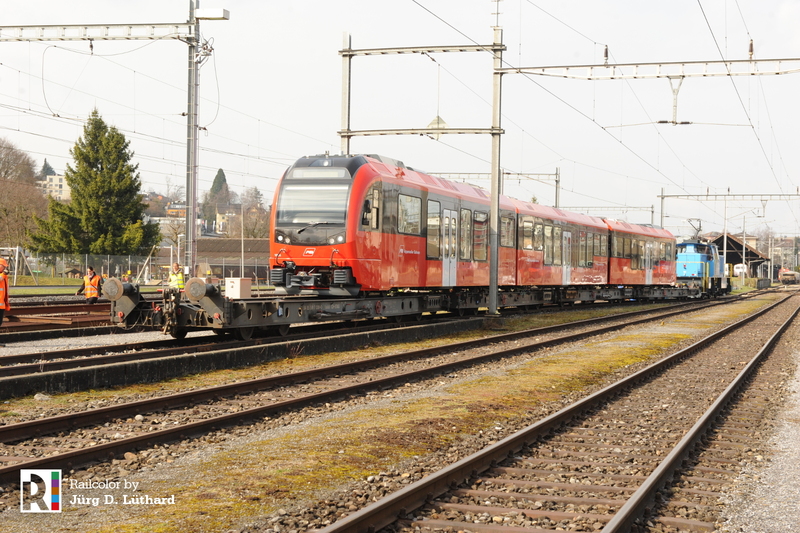 The first Stadler Rail Tango light rail vehicle for the Trogen-St.Gallen-Appenzell line was delivered in St. Gallen in the night of 22/23 March. Only a few days later the first Stadler Rail electric train ABe 4/12 for the Gossau-Appenzell-Wasserauen line was delivered to Gossau. Swiss railway company Appenzeller Bahnen (AB) operates several narrow gauge lines and one standard gauge line in the Swiss kantons of St. Gallen, Appenzell Ausserrhoden and Appenzell Innerrhoden. 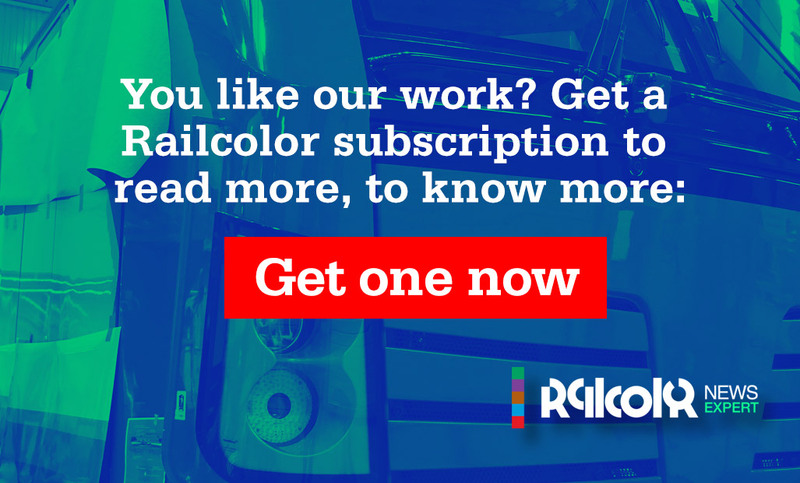 It intends to connect the seperate meter gauge routes between St. Gallen-Trogen and St. Gallen-Gais-Appenzell in St. Gallen in the ‘Durchmesserlinie’ project. The new rolling stock is ordered to enable through running between these routes. operating more comfortable and less expensive rolling stock. The cost of the Ruckhaldetunnel is around 63 million Swiss francs. During the night of 22/23 March 2018 the first Stadler Rail Tango light rail vehicle was delivered to Appenzeller Bahnen. The 6-car narrow gauge vehicle came to St. Gallen from the Stadler Rail plant in Altenrhein by two trucks. The two halves of the new Tango vehicle were unnloaded one by one, literally in streets of St. Gallen near the railway station. The unloading of the first part can be seen in the following time-lapse video. After the arrival and unloading of the second half, both parts were united. Later that night the complete Tango drove under its own power to AB’s Speyer depot in St. Gallen. 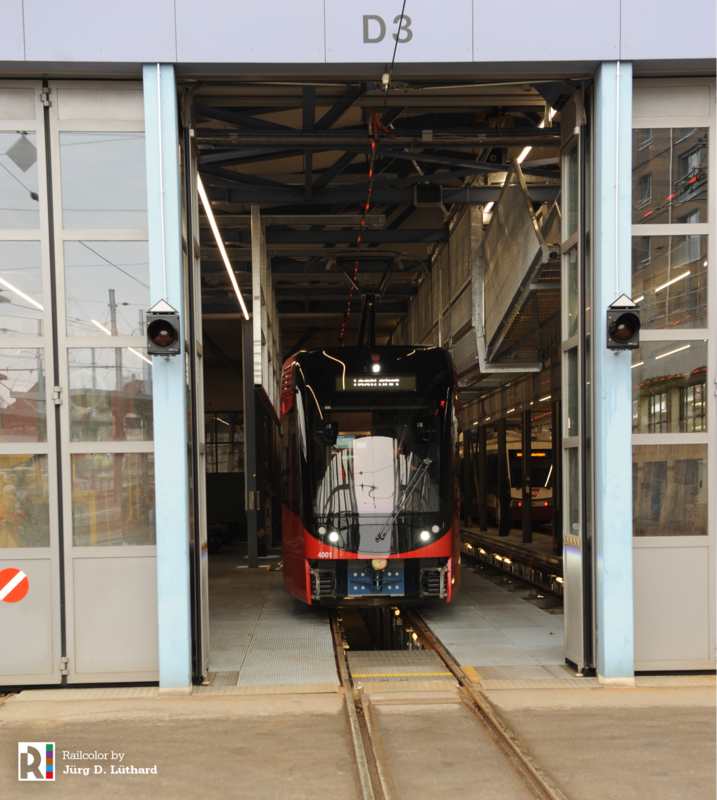 A few days later, 26 March 2018, the Tango light vehicle, numbered 4101, was shown at the depot. Revenue service for the first Tango vehicle is scheduled for August 2018. Appenzeller Bahnen ordered the 11 Stadler Rail Tango vehicles in a 84 Million Swiss Francs deal. 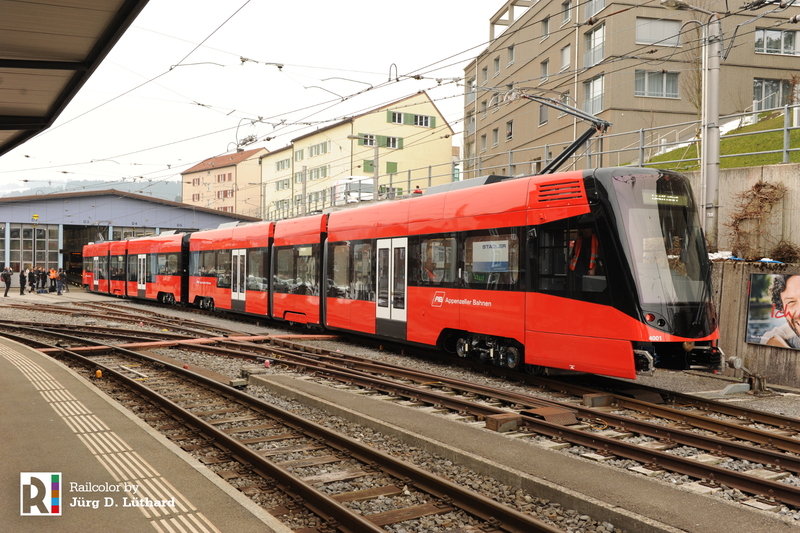 The Appenzeller Bahnen choose for a proven concept with the Stadler Tango as Basel’s BLT (38 units) , Genena’s TPG (32 units) operate Tangos in Switzerland and the Lyon airport shuttle Rhônexpress in France as well. 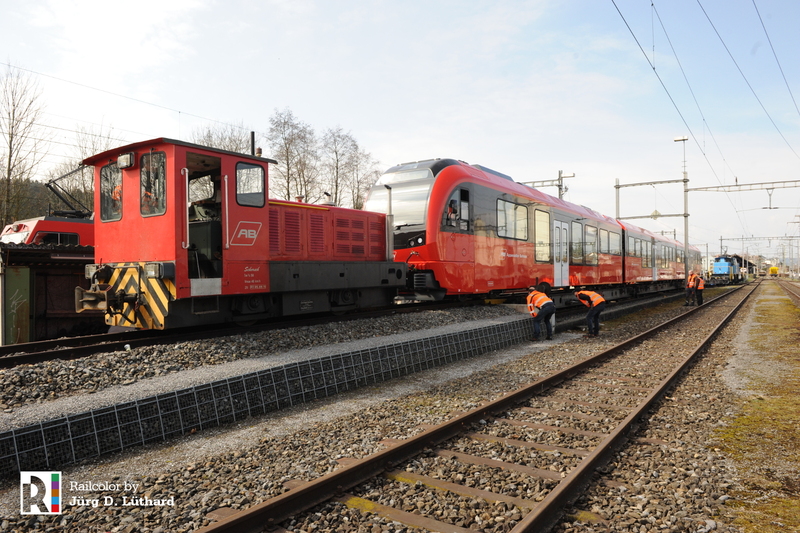 Only a day later (27 March 2018) the first of five 3-car narrow gauge electric train (Class ABe4/12) comes from Bassnang to Gossau on transporter wagons pulled by Stadler’s own Eea 131 electric locomotive. After shunting the Eea 131 pushes the transporter wagons to the gauge transfer table. After making the necessary preparations AB’s Schöma shunting locomotive Tm 2/2 98, nicknamed ‘Schorsch’, pulls the new “Walzer” train 1001 onto the meter gauge tracks. AB ordered five of these ABe4/12 electric trains from Stadler Rail for 40 million Swiss Francs in 2016. The train is due to enter revenue service in May 2018. Each “walzer”electric train will get its own character. Appenzellerland customs are shown: Silvester, Alpstobete, Betruf, Bloch and Alpfahrt. Vehicles have to use grooved rail inner city tracks (St. Gallen) as well as ‘normal’ rail tracks (route to Appezell). This results in adjusting the wheel profiles of rolling stock and adjusting some switches and tracks. On certain routes the tracks will stay unchanged to keep access to the depot in Gais.